LOS Angeles Galaxy became the first team in Major League Soccer to clinch a play-off berth on Friday night but remain focused on successfully defending their Supporters’ Shield title. The Galaxy secured their route into the MLS final eight after Landon Donovan’s first-half strike against Colorado Rapids was enough to separate the sides, despite an inspired performance from Rapids keeper Matt Pickens. Having led the Western Conference for much of the season, Galaxy’s triumph come as no real surprise and Bruce Arena’s side now seem destined to win the Supporters’ Shield – the trophy awarded to the best MLS club during the regular season – with a seven point lead over second placed Seattle, with six games remaining. Undefeated at the Home Depot Centre this season, captain Landon Donovan told the club’s official site that making the play-offs is their first objective. Defender Todd Dunivant also remains focused on winning the Supporters’ Shield. “We’re looking to the Supporters’ Shield. [Clinching a play-off spot] is not our focus. That wasn’t our main goal this year. That’s obviously something we wanted to do. 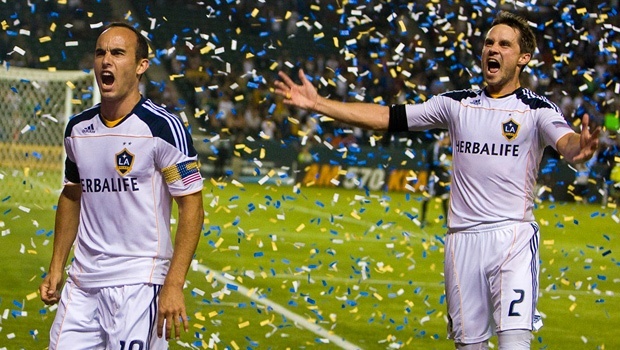 I think everyone knew we were on our way anyway,” he told the official Galaxy site. The Galaxy can also go a long way in advancing from Group A of the CONCACAF Champions League this Wednesday in Mexico against Monarcas Morelia. Galaxy travel to Mexico with maximum points from the first two games, three points ahead of second placed Morelia.